Focused on incoming tourism, we are dedicated to help you to find a better solution for your China Tours. If you have any concerns or queries before or during your trip, do not be hesitate to ask your travel consultant, or contact our customer service manager at . Have an idea about your China tour? If you already have some idea about your China tour, simply use our tour search tool or quickly find one from our Top 10 China Tours. Need a tailor-made China tour? If you want to have a tailor-made tour on your own needs and budget, just use our custom inquiry form. Why Travel with China Odyssey Tours? 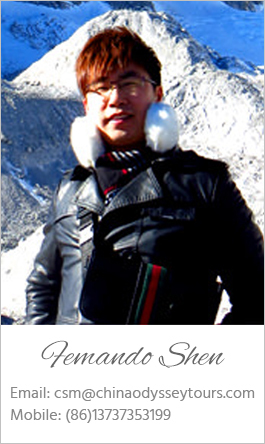 Experienced Travel Consultant with intensive travel experience to every corner of China. Local Tour Operator in China with deep-rooted network & immediate response to any possible problem during the tour. 24/7 Customer Service from your travel consult & customer care manager get your back the whole trip. More about China Odyssey Tours. We have collected some frequently asked questions for your China tours. If you can not find an answer about your question, please contact us.